working with a bad boss | SeibCo, LLC. Many bosses today have become fearful of losing their jobs and being unable to find equivalent or better ones. They spend more time manipulating others’ perceptions of their worth in order to keep their jobs than achieving the required results. Their lack of commitment to the company, its employees, customers, and communities usually turns their fears into the reality of becoming unemployed! As a boss, remember that if employees are not doing their work, it’s a reflection of your management style. If you are not achieving the results, you are not taking the right, focused action steps. If you are blaming others for your challenges, you are probably not in the right job! Get help now! Hire a coach and develop clarity to do the right work. Are you a trustworthy boss? I recently received a call from a new boss who wanted to know what type of “penalties” he should apply because his employees were not responding to his emails fast enough. The more important question would be why are they not responding? Are they unclear about his request and timeline? Are they incredibly busy handling his clients’ needs? Does he have a bad tendency to make all his requests “Urgent?” Although his employees might not see his management style as autocratic now, it won’t take long for them to stop trusting him if he relies upon “threats” to get the job done. The bottom line is that in order to build a company of loyal employees, you need to create a level of trust between you and each of your employees. Continually threatening people with loss of jobs, perks, or being written up, will only cause them to lose their trust in you. It’s hard for employees to do their work when they are fearful. Emails. If you need to send additional requests, mark them “Second Request,” THIRD Request,” or FOURTH REQUEST at the beginning of the subject line. If it is Urgent, do the same. However, don’t use these terms often or they lose their attention grabbing effect. Normally give them at least 24 to 48 hours to respond. If it’s not urgent, provide a suggested “due date” for their response. Pick Up the Phone. If it is truly urgent or complicated, or you don’t have strong writing skills, call them. Person-to-person dialogue often prevents misunderstandings. It’s your responsibility as the boss to exercise persuasive listening skills to ensure your employees understand what you are requesting. Quality of Work. If someone does not have the skills to do the work, simply sending it back along with an implied or even overt threat will not get you the quality of work required. Take time and walk them through exactly what you need, and the format you need it in (e.g., Word, Excel, numbers, graphs, columns, etc.). Keep your requirements simple if someone is developing their skills. A woman with specialized technical skills was hired by a company to help them avoid lawsuits. However, her manner of interacting with the management team had them failing to respond to her demands. Instead of her boss talking with her and offering her guidance, he simply waited until the lawsuit had been averted and fired her! Coaching. Simply getting what you need from someone and firing them without warning only compels others not trust you or your leadership style. If someone needs help to improve interpersonal, management and/or project skills, provide them with the necessary training. Arrange for their own coach (from outside the company) to help them excel in their current position or as they move through a necessary job transition. Bottom line? When people are not responding in a respectful manner and are busy taking copious notes, there is no trust. Work with your business advisor and take an objective look. What do you need to transform in your approach and management style to be a leader who elicits trust, a leader others want to follow. A company wanted to terminate an employee who was not achieving results. She had a multitude of excuses, blamed her boss for his lack of support and refused to be held accountable for her employees’ actions. When the boss had had enough, the HR Director stressed, “Her employees won’t be happy. She is well liked.” The reality? Many of her employees were happy to see her go since they already realized she was the bottleneck for not getting things done, poor decisions being made and low morale. Laissez-faire leadership has been creating a devastating impact on companies worldwide, according to Herman Trend Alert, August 22, 2012. Many business professionals are not holding themselves accountable for their results or their employees’. They blame increasingly complex business environments, workloads and lack of financial and other resources. 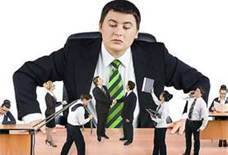 To complicate these concerns, many leaders have become more concerned about being liked, holding onto their power of control, not rocking the boat or micromanaging to the point of exhaustion. Delegation. Work-life balance is something we strive to achieve. We blame our employers for our failure to achieve this ideal. The truism is there are time periods when personal concerns (e.g., health, family, and home) will take precedence in your life. There are other times when your professional considerations require stronger attention. Be proactive. Learn to manage these inevitable transitions by requesting help (at home and work). Stop waiting for the perfect time to cross train. Do it now before the need arises. Learn to trust others to make decisions appropriate for their experience and abilities to alleviate bottlenecks before they start. Build on strengths. When you are in a job that aligns with your strengths, work life becomes easier to manage. The same is true for your employees. Learn how to hire people who fit their work, and how to manage them accordingly. Hold your employees accountable for results, sales quotas and other objectively set metrics. If employees are unable to meet these measures, it may be time to review their fit with the job. A good person in the wrong job can inhibit her/his own ability to accomplish normal tasks with ease, and issues seem to get muddled and, never resolved. Take the time and spend the money to hire the right people. Learn how to create a work flow that recognizes a person’s strengths. Handle the Elephants. Most people love to put off until tomorrow what isn’t urgent today. Unfortunately, this growing stockpile doesn’t deplete naturally and unaddressed issues actually grow exponentially. Hold yourself accountable by enlisting the help of your business advisor as an objective sounding board. Determine effective resolutions for both potential and long-term elephants. You may be pleased to find some can simply be crossed off your list!